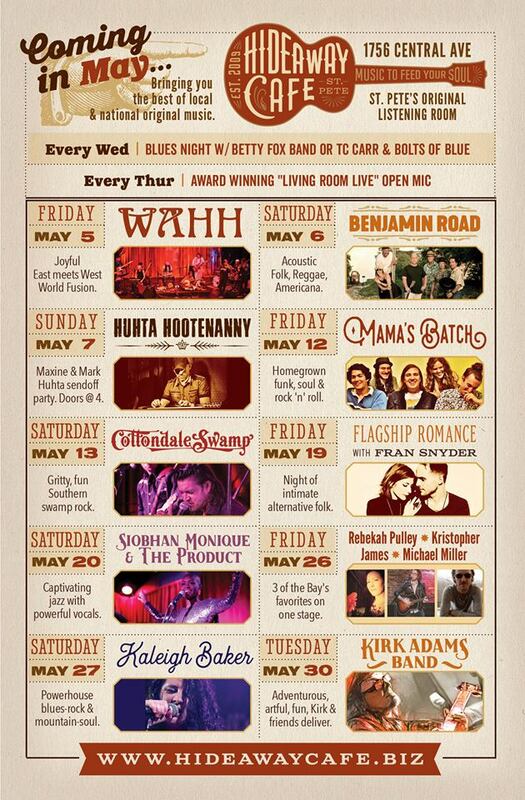 This month: TC Carr & Betty Fox keep our Wednesday Blues Night rockin' Thursday nights are packed with local talent as artists show up and put their name on the list for their 15 minutes of fame (sometimes live recorded). This Friday, Wahh World Fusion Band returns to the Hideaway Cafe stage for their east meets west world fusion. Saturday, Benjamin Road returns for what is creeping up on a SOLD OUT status (so get your tickets!). Sunday is a bittersweet sendoff to our dear friends, Maxine Octavio-Huhta and Mark Huhta (Nashville steals all the good ones!). Then looking ahead to the rest of May, we have some "love of local" pouring out with Mama's Batch (Friday, May 12), Cottondale Swamp (Saturday, May 13), Flagship Romance (not from here, but recently poured out their hearts on stage to a very satisfied crowd at the Palladium's Listening Room Festival Showcase) w/ Fran Snyder (Friday, May 19), Siobhan Monique and "The Product". (Saturday, May 20), Rebekah Pulley, Kristopher James & Michael Miller (Friday, May 26), Kaleigh Baker & Terri Binion (Saturday, May 27) and Kirk Adams Music (Tuesday, May 30)! Whew - it's gonna be a REALLY good month!